We’ve been working up to this one all week! I know, it’s quite a lengthy title, but I had to fit all that in there so you know how much DELICIOUS you’re getting yourself into! Maple cinnamon yogurt parfait’s with candied pecans and caramelized bananas are here to rock your world, y’all. If you all have been following along this week you’ll have seen the recipes I posted for maple cinnamon candied pecans, and paleo caramelized bananas. If not, go ahead and check them out real quick! I’ll wait right here for ya. Both of these mouth-watering + easy (paleo-friendly!) recipes will be used in todays grain free treat // breakfast-if-your-feeling-fancy. 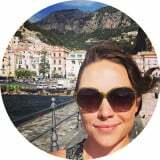 I’ve been doing something similar to an elimination diet for the last 4 months while I work through some food sensitivities and inflammation issues (MRT, anyone? That test protocol is not for the faint of heart), and while the restrictions have lessened up considerably, there was about a month-long period of time where what I could eat was super limited. To like 15 ingredients limited. Let’s just say I had to get reaaaally creative. One of the things I could have, however, was whole fat organic greek yogurt with a little bit of maple syrup and cinnamon. It felt like heaven in a bowl. We all need those moments, right? And once I was able to include pecans and bananas in my sweet treats, too? Well this maple cinnamon yogurt parfait with candied pecans and caramelized bananas was an instant winning combination. If you already have a handle on the pecans and caramelized bananas, this recipe is a cinch to throw together. If you haven’t made those yet, don’t sweat it! They’re both really easy to pull of, and the pecans are a great sweet snack to have around, anytime. No one ever regrets maple cinnamon candied pecans, especially since they’re free of dairy and refined sugar! The parfait doesn’t take much more than stirring some maple syrup and cinnamon into your favorite greek yogurt (or coconut yogurt for all of you who are dairy free!) and layering it with chopped candied pecans and caramelized bananas into your favorite cup or bowl. The result? A slightly sweet, slightly tangy, cinnamon + pecan studded, warm banana kissed, perfect mess. 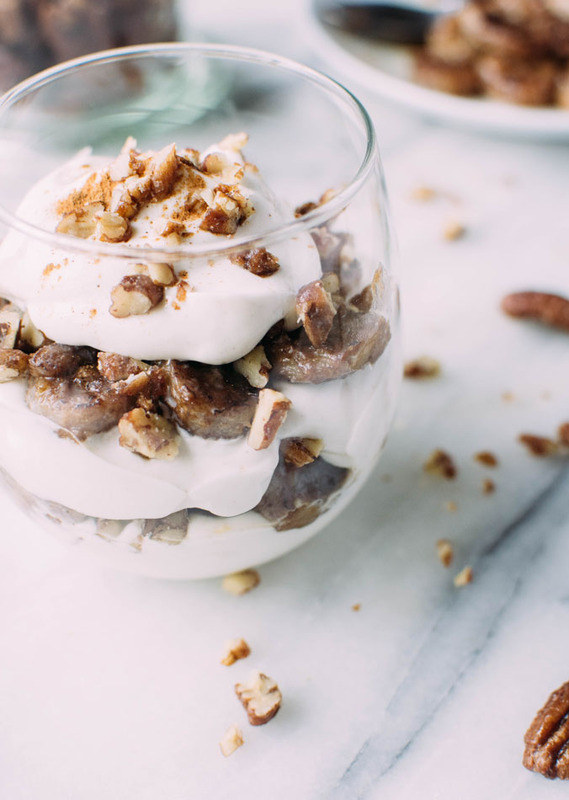 Maple cinnamon yogurt parfait with candied pecans and caramelized bananas is the PERFECT grain free treat / breakfast for all your brunch cravings! Stir together yogurt, maple syrup to taste and cinnamon. 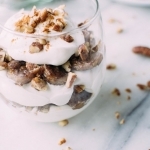 Layer maple yogurt into two cups or bowls alternating with chopped candied pecans and caramelized bananas. Top with a little sprinkle of cinnamon, a few slices of bananas and a sprinkle of pecans. This entry was posted in breakfast, sweets and tagged dessert, easy, gluten free, grain free, healthy, quick, vegetarian on January 20, 2017 by Nyssa Tanner.